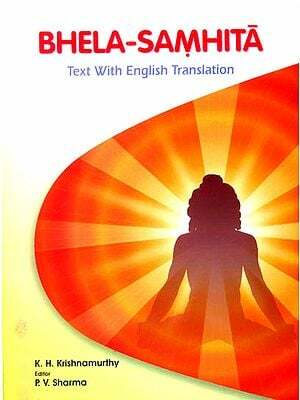 Kasyapa-Samhita or Vrddha Jivakiya Tantra, the only source book of ancient period, of kaumarabhrtya, one of the eight branches of ayurveda hitherto available only with one Hindi commentary done by Rajguru Pt. Hema Raja Sharma of Nepal, though is an incomplete book, however, it provides deep insight about the knowledge and practice of pediatrics during ancient period. Besides kaumarabhrtya i.e. pediatrics including neonatology, the importance of wet-nurse including her preventive, promotive and curative therapies are discussed in very scientific manner. The barrier of language has been a great hinderence in propogation of this book amongst non-Hindi speaking people. Now the book has been transtated in english almost in verbatim, without disturbing the basic idea of the author by authorities of the subject. The commentaries made in the book provide sufficient scope of understanding the subject of Kasyapa-Samhita in relation to four top most books i.e. 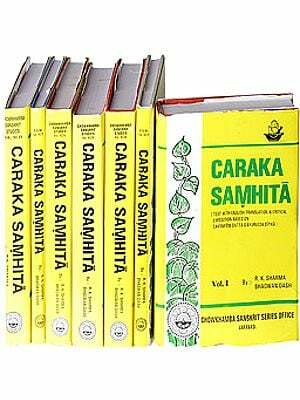 Brhattrayi (Caraka Samhita, Susruta Samhita and Astanga Hrdaya) alongwith Astanga Samgraha, thus, the reader can get almost all the references of these four books also about the topics dealt in Kasyapa-Samhita. Translation of the book has been done in internationally accepted diacritical Marks. “Introduction to Kasyapa-Samhita” is an attempt to study in depth the book Kasyapa-Samhita, the only source book of kaumarabhrtya. 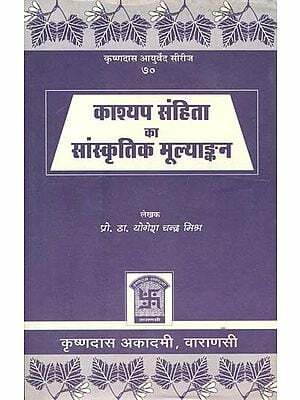 As presently available Kasyapa-Samhita is published on the basis of single incomplete manuscript, naturally various aspects of the book i.e. its authorship specially of supplementary section (khilasthana), its contributions in the advancement of the knowledge of ayurveda in general and kaumarabhrtya in particular, its period etc. need a fresh look. In present book an attempt has been made to discuss these various aspects on the basis of internal and external evidences, naturally it is likely to be very useful for historians, research workers, teachers and students of ayurveda. Prof. (km.) P.V. Tewari, well known for her work on Prasuti Tantra and stri-roga; the daughter of freedom fighter Late Pt. Rama Shankar Tewari, a recipient of Tamra-patra awarded by the then Prime Minister of India Late (Mrs.) Indira Gandhi, was born in a middle class family of a village Amour, Distt. Kanpur, U.P. on 5th August 1937. After competing her education and initial service joined Faculty of Ayurveda, IMS, BHU in 1964, was promoted to professor in 1977, remained Head of the department of Prasuti Tantra for more than 25 years and became Dean of the Faculty twice. She has produced large number of D. Ay. M./M.D. Ay. And Ph.Ds., has authored more than 250 research papers and five books. She has been associated with academic/administrative bodies of all important research and academic organizations of ayurveda of the country and has participated in national/international conferences. Her book “Ayurvediya Prasuti Tantra evam Stri Roga” has received good recognition and awards. The Vrddhajivakiyatantra, popularly known as Kasyapasamhita, is a compendium based on the precepts of Kasyapa composed by Vrddhajivaka and further redacted by Vatsya, a scholar belonging to his clan. 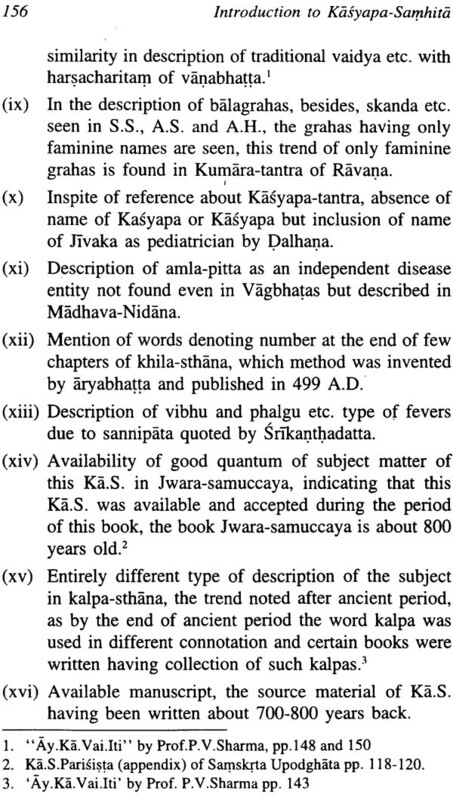 This is the only surviving text on one of the eight specialities of ayurveda known as kaumarabhrtya (pediatrics including obstetrics and gynecology); hence it is natural that kaumarabhrtya is declared as the foremost of all the angas of ayurveda in this samhita as salya and kayacikitsa in the samhitas of Susruta and Caraka respectively. 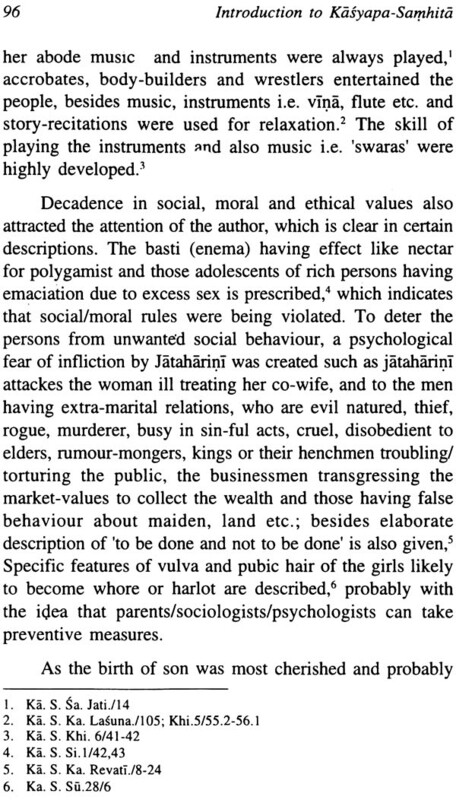 In ancient times, kaumarabhrtya was much developed and its experts were in great demand even in high societies. 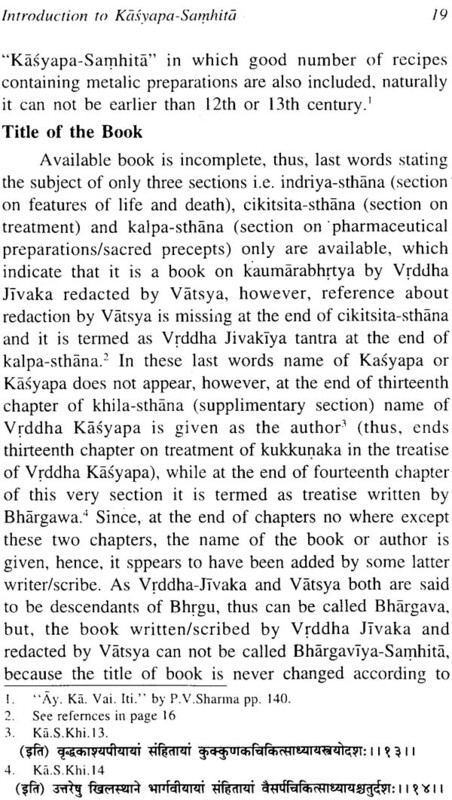 Kalidasa mentions the vaidyas expert in kaumarabhrtya (kumarabhrtyakusala-Raghu. 3.12) and they also find place in Kautilya’s Arthasastra (1.16.10). Dalhana in his commentary on the Susrutasamhita (U.1.5) mentions the treatises of Parvataka, Jivaka (Yacaka? ), Bandhaka etc. which are not available now. The present Kasyapasamhita is based on a single manuscript deposited in the Durbar Library, Kathamandu. It is in Newari script and broken in many portions but looking to its importance it was deciphered by Rajaguru Pandit Hemaraja Sharma of Nepal and published by Choukhamba Sanskrit Sansthan, Varanasi. Another such instance is the Bhelasamhita which is also based on a single manuscript deposited in the Saraswati Mahal Library, Tanjore which is processed through three different editions (Calcutta. Varanasi and Delhi), and the fourth one is under preparation in the Netherlands, but it is surprising that nobody came forward to re-edit the text of the Kasyapasamhita. The reason may be that Bhela was regarded as more important by virtue of being one of the six disciples of lord Atreya, occupying the position only next to Agnivesa, while Kasyapa was out of this main stream. The author of the present text too could not take it up in her translation of the Kasyapasamhita, published recently, due to several difficulties and as such this task is again left for future workers. In my opinion, there is still vast scope of improvement in the text after rechecking the manuscript which is quite mutilated with confusing readings at several places. ‘Introduction to Kasyapasamhita’ is a critical study of the Kasyapasamhita dealing with its authorship, date, contents and cultural date. An attempt has also been made to compare the text with that of Caraka, Susruta and Vagbhata and highlight the originality and contributions of the Kasyapasamhita. 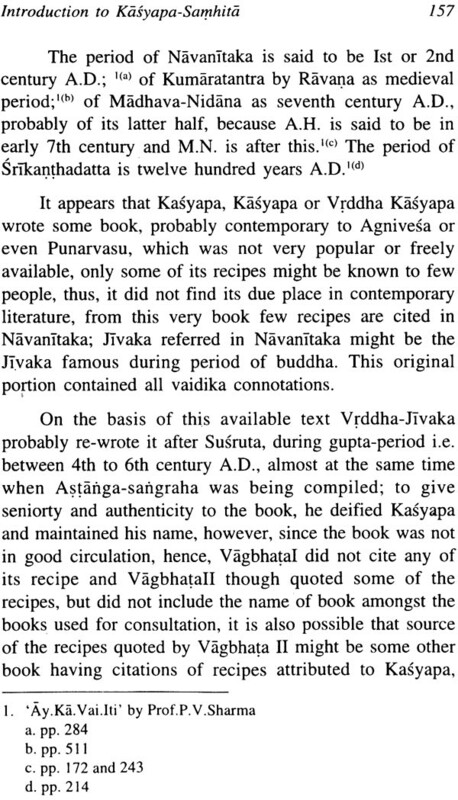 While discussing different strata of the authorship a novel idea has been proposed that even after Vatsya the text of the Kasyapasamhita was retouched by some anonymous author between 11th and 13th cent. A.D. supporting it by a number of arguments. This deserves consideration and further examination by experts. It is gratifying to note that this work has been ably done by Prof. P.V. Tewari, one of the eminent ayurvedic experts in kaumarabhrtya and author of many books. In fact, no other scholar could have been more fitting for this specialized job. I congratulate her for this excellent contribution to the ayurvedic literature and wish that she would produce many more works in coming years. 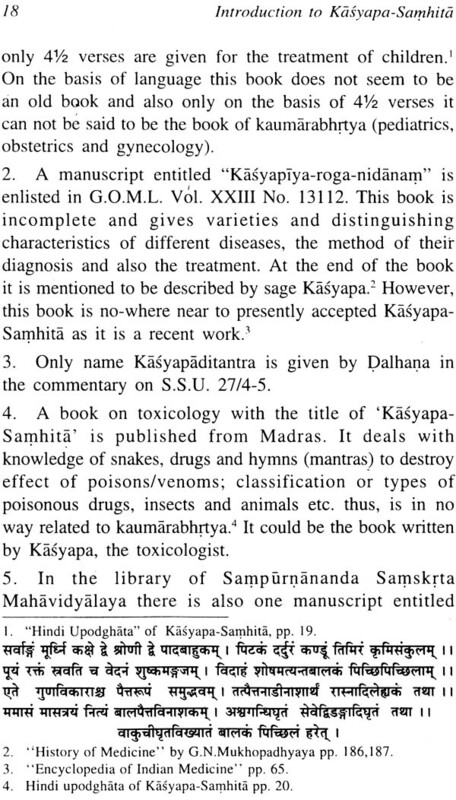 Kasyapa Samhita, the only available source book of kaummarabhrtya specially pediatrics, did not receive its due recognition/attention in ancient and medieval period, probably, due to its non-availability or non-recognition in society, as no commentator has given his scholarly views on this. Even in this twentieth century, the period which may be considered as the period of renaissance of ayurveda, except Pt. Hema Raja Sarma, the present resurrector of the book and Sri Satyapala Bhisagacarya the hindi commentator, no other erudite has paid any special attention, albeit the historians like Prof. P.V. Sharma have deliberated upon it from the view-point of history. For this apathy there could be two probable reasons i.e. primarily incomplete nature of available book and secondly less importance give to the pediatrics as an independent speciality in ayurvedika world as it is still being dealt in majority of the institutions of ayurveda with prasuti-tantra and stri-roga (obstetrics and gynecology), naturally the book of pediatrics did not get that importance. Pt. Hema Raja Sarma and Prof. P.V. Sharma have dealt so exhaustively about different aspects of this book leaving practically no major scope for further work, however, what-so-ever and how-so-ever is written about any book, it can never be said to be the last word; a little corner in a wide canvas is always vacant inviting inquisitive workers to try their luck, this analogy is the basis of present work, in which an attempt has been made to introduce this Kasyapa-Samhita in its entirety. As stanzas/verses of certain chapters of available book are un-numbered, which create problem in citing the reference, hence, all such stanzas/verses have been numbered serially. 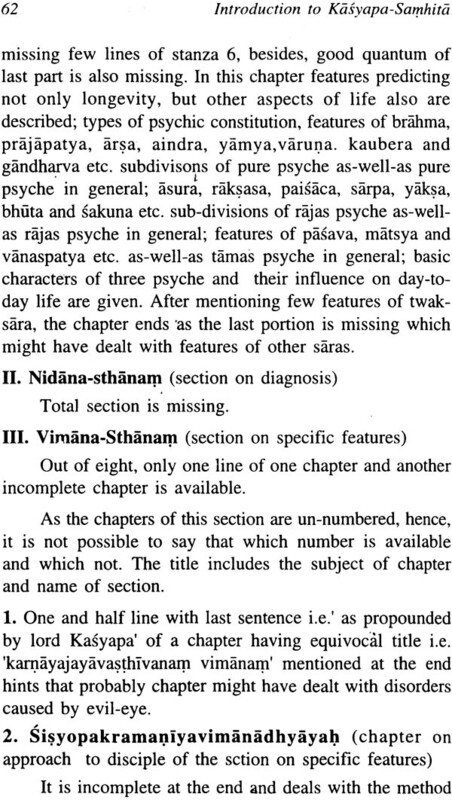 Names of classics and sages related to ayurveda only have been mentioned with first capital letter, while all other nouns are given with small letters. In description, internationally accepted diacritical marks have been used. To prevent and protect one-self from any trauma or danger and march forward with a peaceful, happy, productive and healthy long-life is an intrinsic desire of every living-being. The man, even before he knew to express or write, possessed the inherent knowledge of medicine, in order to protect or treat himself, in which, his close association with birds, animals and plants provided a handy god-send asset, as the birds, animals and plants provided a handy god-send asset, as the birds or animals treat their ailments by consuming plants. By the time the man acquired the knowledge to express in writings, the medicinal values of water and plants were already well established; thus, in first available written literature i.e. vedas, a well documented record of these is available. The difference between medicinal plants termed osadhi or bhesaja and vanaspati (plant kingdom) or virudha was recognized. The Aswinis were called bhisak as they utilized the bhesaja to alleviate the sufferings. Various deities were prayed to provide osadhi which had the lusture like fire. Osadhi is included as god of hymn (sukta) and prayers are offered to various drugs to cure diseases. Because of this eternity of the knowledge of medicine, the ayurveda surpasses all imaginations regarding its origine, thus, is said to be tought to mortals by the god of creation lord Brahma himself. Ayurveda is said to have descended from its celestial to terrestrial state in the form of either trisutra/triskandha i.e. hetu (etiology), linga (clinical features) and ausadha (therapy) or astanga (eight branches or specialities) i.e. kayacikitsa (internal medicine), salya (surgery), salakya/urdhwanga (otolaryngology and ophthalmology), kaumarabhrtya/balaroga neonatology, pediatrics, obstetrics and gynecology), agada-tantra/damstra (toxicology), bhutavidya/graham (demonology), rasayana (preventive, protective, rejuvenating medicine including geriatrics) and vajikarana (aphrodisiacs), this division is based on clear and critical understanding as-well-as practical/therapeutic application of subjects in order to alleviate pains of suffering humanity, as-well-as to provide optimum state of health/pleasure, so that the mortals could fulfill their all esanas (ardent/ultimate desires). The order of presentation of these eight branches differs according to importance given by different authors i.e. 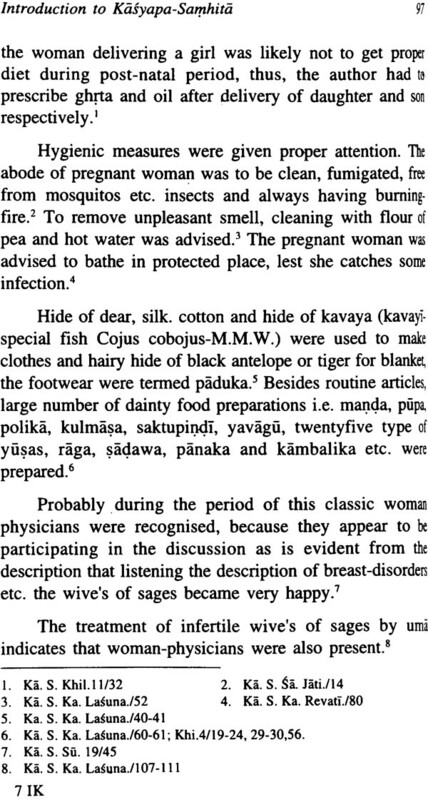 kayacikitsa (internal medicine) is said to be the first by Caraka and Vagbhatas; Susruta has kept salya (surgery) as first, while in Kasyapa-Samhita the kaumarabhrtya (pediatrics, obstetrics and gynecology) is said to be the first. 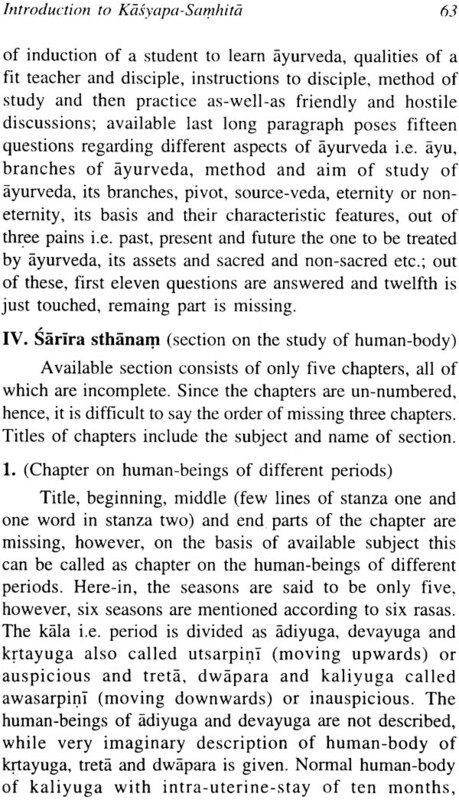 As first few chapters of available Bhela-Samhita are missing, thus, it is very difficult to say the branch mentioned as first in this book, but this also must have kept kayacikitsa (internal medicine) as first, because it says that who treats the diseases of body of human-being by application of ayurveda, he is kayacikitsaka (physician or expert of internal medicine); he has further advised that diet to be taken or not to be decided by the physician (kayacikitsaka), while remaining acts i.e. cutting, incision, suturing etc. are to be done by the surgeon (salyakrta), in other words physician is given more importance than surgeon. In Harita-Samhita though salya (surgery) is mentioned as first branch, yet, subsequent description of entire book does not show any predominance of subjects related to surgery or even otolaryngology including ophthalmology. The book is not accepted as an original work contemporary to Caraka, Susruta or even Vagbhatas, rather it is written probably in twelfth century A.D. The sages after learning ayurveda from god Indra wrote classics probably on all these eight branches as per their interest. To-day we get number of books on kayacikitsa (internal medicine) and only one but almost complete book i.e. Susruta-Samhita on salya (surgery) with salakya (otolaryngology wit ophthalmology) and also only one but incomplete book i.e. Kasyapa-Samhita on kaumarabhrtya. Though Vagghatas have given relatively more salya with salakya and kaumarabhrtya than Caraka and Caraka with Susruta respectively, however, their emphasis is also on kayacikitsa, thus, are the books of this speciality. 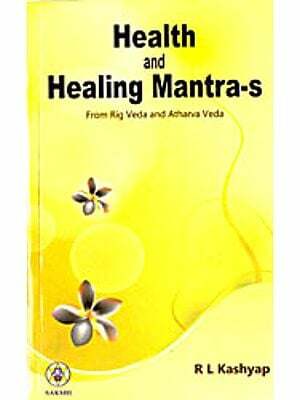 Though these books are basically devoted to one particular branch, however, in order to provide clear cut scope for inter-disciplinary understanding and research, the subjects of other branches also except bhuta-vidya (demonology) are described. Present available book Kasyapa-Samhita probably one-fourth or even less of its original form has been made available to the world of ayurveda by Rajaguru Pandita Hemaraja Sarma of Nepal in the year 1938, who has not only scribed it in devanagari from its nevari script of eighth or ninth century A.D., but has also prefixed highly educative scholarly ‘upodghata’ throwing light on its probable date as-well-as historical importance in relation to general history and also history of contemporary ayurveda.